I saw my first gray hair at 25 as I was adjusting the rear view mirror of my used, 1975, Datsun B-210 Honey Bee. It was a surprising sight, but it shouldn’t have been. My dad started graying at 17. In fact, I have no recollection whatsoever of him with what he used to describe as his original, chestnut brown hair. Not so coincidentally, my dad, had no memory of his own mother with anything other than her grandma white, snowy, crown. Anyway, I pulled it out. The hair that is. And I didn’t think too much more about that singular omen of what was a head (every pun intended) until my early thirties when it returned, started networking, and invited family and friends to move in all over my scalp. Even so, for the next thirty some years, I successfully ignored these unwanted visitors by establishing a monthly, never to be missed, date with my wonderful hairdresser and colorist extraordinaire, Roe. Fast forward thirty some years. I find myself at an important coloring crossroads. 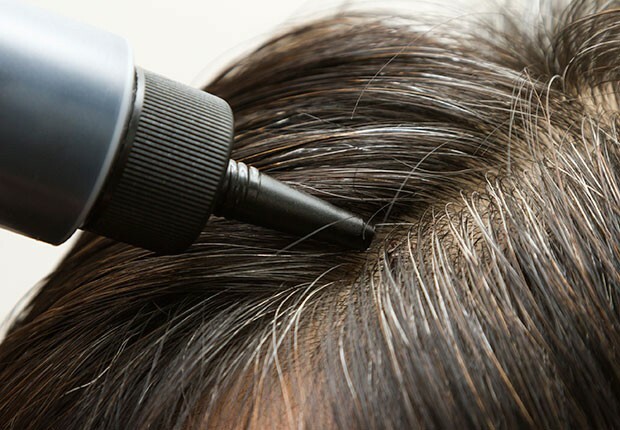 Many women (I’m excluding men because everyone knows they look great with white hair which is totally not fair, but I digress) have welcomed their grays gradually and gracefully as they arrived; others have vowed to meet their maker only after stopping first for a root touch up. I, however, find myself among a small, but select group, of former dedicated dyers now stuck in the gray zone. Inspired by the like of a beautiful and brave colleague from work (Deb, it is you), who has been making the transition from color to gray over the last year, I have decided to free my long overlooked white locks. Why now? I’m not really sure. Maybe, it’s because I am too lazy to make the trip to the salon ever 4 weeks religiously and without regard to the weather forecast: hail, snow, sleet, locusts…you get the idea. Maybe, it’s because I am trying to embrace my actual age and be proud of it? No. That can’t be it. Quite possibly, it’s because I hope the lighter tresses will soften the facial acquisitions of age and make me glow like an angelic celebrity. 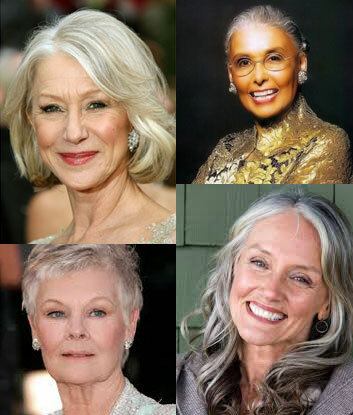 Think Dame Judy Dench, Lena Horne, Helen Mirren and that beautiful older model with the long hair whose name I don’t know*, but you know who I mean. For whatever reason, I have decided to take the risk of seeing what I actually look like and chronicling the experience on this blog. At least I think I have**. This is not going to be pretty guys and I don’t mean just the hair. I am vain. Very vain. I am also a Virgo. Translation: little things drive me nuts like when my roots start to show. And I am vain. Oh! Did I mention that already? Not a good start, I know. Unlike those brave soldiers who can quit the color cold turkey by chopping their hair short and letting their white roots be damned, my plan is to employ whatever pigmenting trickery can be chemically engineered and applied. I will not go gracefully into the white. And so, after receiving such well-intended and heartfelt counsel by my daughter as “gray hair might make you look older mom” (she’s right and I asked for advice), as I let myself go “gradually gray”, I entrust myself to the high-lighting, low-lighting and counseling skills of my talented stylist and friend, Roe “shout out” @Nova Salon in Philly. I embark now on this intrepid course to let my natural white shine through with commentary to follow at intervals when I am not crying or out buying hats. * I really do know the model’s name. It’s Cindy Joseph. ** I do reserve the total right to call this whole thing off if I can’t take it any more. This entry was posted in a certain age and tagged aging gracefully, going gray, gray hair, letting dyed hair grow out, white hair by Rhonda. Bookmark the permalink. I may totally chicken out. I have about a half inch of gray and I am already going nots with it. I will keep you up to date. I had my brown hair colored the first time by my sister with assistance from our mother who had had her own salon when she was younger. There was a lot of cussing on my sister’s part and probably some laughing from my mother and me. After it was done, my sister said that it would cost me a thousand and two dollars the next time I wanted it done! Why that price? Two dollars for the box of coloring and a thousand dollars for her, because she wasn’t going to do this again!! I have it done in a salon now, a cut and color every two months. My sister has decided to let her gray hair grow out, but it’s difficult to see in among her blond hair. I think if I let my gray hair grow out I’d be channeling “The Bride of Frankenstein” with my look, and no one wants to see that! !